Gurjit Kaur ekes out a living by doing odd jobs at Amritsar's Golden Temple. 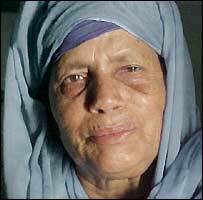 She lost her husband and 14-year-old daughter during Operation Bluestar. Later, her oldest son was killed by police. Two other sons took to arms and became militants - they too were killed in encounters with security forces. Her youngest boy was only 14 when he also disappeared after the police took him away. "I have been left all alone in this world. Army soldiers killed my husband Gurmej Singh and our young daughter Jasvinder." Almost her entire family - her farmer husband, four young sons and her daughter - over the years fell victim to the mindless violence that enveloped Punjab through the 1980's and early 1990's. 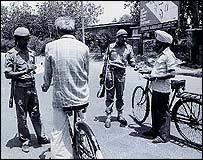 It all started with Operation Bluestar in June 1984. "It was Guru Arjan Dev-ji's Martyrdom Day in the beginning of June that year. "Gurmej Singh was a deeply religious man who visited the Golden Temple at least once every month. He was also an ardent admirer of (militant leader) Sant (Saint) Jarnail Singh Bhindranwale. "He left our home in Village Sodhiwala in Punjab's southwestern border district of Ferozepur along with our elder daughter, who was only a young child at the time. "They were inside the Temple when the army launched its attack. "Gurmej Singh and Jasvinder never returned home. "All I know is they were among the thousands who were killed by the army that day. We couldn't even perform their last rites. "To add to our grief, the police began harassing us because they recovered some pictures of Bhindranwale which my dead husband had once bought. "My eldest son Kashmir Singh - 22 years and working as a mechanic at a nearby workshop - was picked up and killed. They threw his body in a drain outside the village. "Intensely angry over the injustices we were forced to suffer, two of my younger sons left home to join militant organisations. "I did not attempt to stop Jaspal Singh and Tarlok Singh from going away. "I do not know if they were able to avenge the deaths of my husband, daughter and older son, but some years later - around 1991 - both the boys were shot dead in encounters with the police. "I did not grieve - they had given their lives while serving the cause of the Panth (Sikh community) and the Gurus. "But the police did not stop at this. "One day - also in the year 1991 - a bunch of police wallahs came to my house and picked up my younger daughter, youngest son and me. My daughter and I were locked up in the Jail at Nabha Town. "But I still do not know what became of my youngest child. Baljinder Singh was only 14 years old. "He simply disappeared from the custody of the police. "Twenty years have gone by but I still cry each day. I cannot forget how my entire family was wiped out. "Those who have seen the blood of loved ones spilt will never forget and I will carry my memories with me to my funeral pyre. "Today I am all alone. My only surviving child lives with her husband outside Punjab. She does not visit me because the police harass her each time she came here in the past. "My only remaining wish is to identify the men who killed Baljinder Singh. He was only a innocent little child. "I want to know what kind of men could bring themselves to murdering a child. I want to know if they made my sweetest child suffer. "My heart will not stop aching. Nothing else matter to me now."